As a child, I had always avidly watched coverage of the London marathon on TV. The whole spectacle was simply amazing to behold, but I never dreamt that one day I would have the opportunity to be part of such an event. 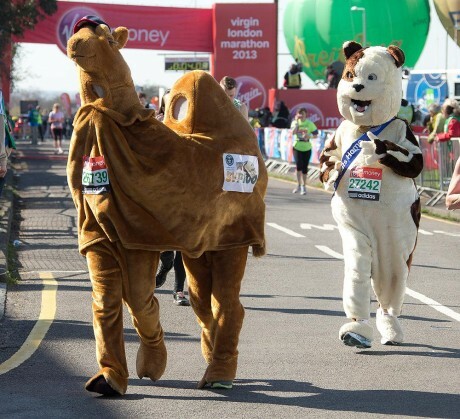 At the time I thought that the London marathon must be the largest and most amazing marathon in the world, and I simply had no idea that other significant marathons existed across the globe. It was only after running London a number of times that I became aware of a series of big city marathons across the globe called the Abbott World Marathon Majors. Back in 2006 there were 5 annual races in a marathon championship series, and Tokyo was added relatively recently in 2013. The beauty of these events is that it’s possible for a normal person like you or me to compete in the same race as the very best runners in the world. Although we are never likely to win the WMM series and the prize money of $500k, it’s still amazing that we can stand alongside individuals who will be known as some of the greatest runners in history, such as Paula Radcliffe, Mo Farah and Haile Gebrselassie. Since the age of 8 or 9, I had been fascinated by the London marathon. I was a keen cross country runner at school, but throughout university I retired my running shoes and focussed on martial arts. It was only when I moved in with a good friend after university that I became interested in running again. 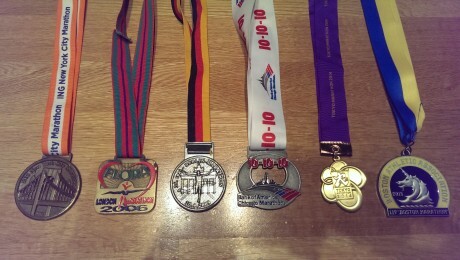 My flatmate Alex entered the London marathon in 2000, and it was only after his successful completion that I thought…’if he can do it, so can I’. So I signed myself up to the Leeds Half marathon and then the London marathon. After having completed the former and having run no further than 13.1 miles, I set off down to London feeling rather nervous but incredibly excited to be part of this great event. 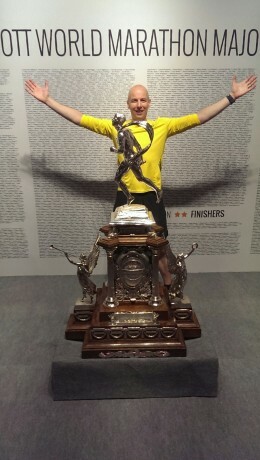 I’ve now run London 8 times and it truly is a fantastic race. London has been going since 1981 and it’s now the largest single fund raising event in the world, with £53.2m raised in 2014. It’s a very scenic race, taking you past many famous landmarks such as the Cutty Sark, Tower Bridge, the Tower of London, the London Eye, the Houses of Parliament and Buckingham Palace. The race starts from Greenwich Park from multiple locations, and it’s generally very easy to use public transport to travel out there, seeing as it’s a short distance from the centre of London. You can literally turn up, drop you bags, visit the portaloo and run, so there is no need to hang around for too long. You will be amazed by all the fancy dress runners, music and party atmosphere during the event, and supporters normally line the whole route making plenty of noise. You are also likely to see celebrities running the race. In recent years I’ve overtaken the likes of Frank Bruno and Gordon Ramsey, to name but a couple. The best thing about London has to be the fundraising, fancy dress and party atmosphere! There really is no other race like it! A few years after running London, I decided that I’d like to experience some of the other big city marathons. Having never visited New York, I figured it would be a fantastic excuse to visit the city and catch up with a few friends who lived out there. At the time, I was able to apply through the ballot and immediately succeeded in securing a place. The popularity of the marathon has soared since and I believe it’s now much harder to obtain a spot, and good for age times are very tough to achieve. Having said that, the same is true of all the World Majors. You generally have to put your entry in as soon as the ballots open, unless you are lucky enough to be a very fast runner with a qualification time. The New York marathon was an incredible experience. My only negative would be the waiting time before the start of the race. The organisers transport you over to Staten Island well before the actual start time, so that they can shut the Verrazano-Narrows Bridge to traffic. However, this can mean hanging around for 3 hours or more. This is fine if it’s a sunny and dry morning, but could be quite a miserable experience if the weather is unkind. As you’d expect, the support in New York is fantastic and very vocal. I remember one rather large and scary looking gentleman leaning over the barriers as I passed through the Bronx shouting in my face ‘I’m proud of each and every one of you’ in a broad New Yorker accent. I actually found that quite motivating! You pass through a number of districts during the race, and it’s truly epic running over the Queensboro Bridge and through Central Park towards the end. You also find that a number of celebrities also run New York. 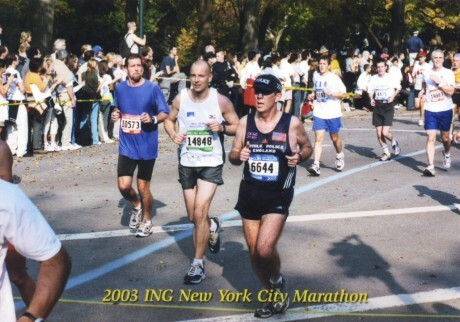 I recall overtaking P Diddy and his entourage of security guards around mile 6. He was no doubt weighed down by his fur coat and excessive jewellery. The best thing about the New York marathon was the moment you leave the Queensboro Bridge and enter First Avenue. The silence of the run over the bridge is suddenly broken by the deathening roar of the crowds as you turn the corner onto First Avenue. It’s a truly memorable experience and you feel like a superstar for a couple of minutes. 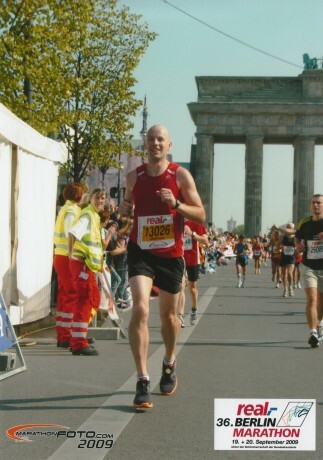 I’d never been to Germany before, so was excited when I signed up to the Berlin marathon. It’s where the world record had been set (and still currently stands), so I was looking forward to a fast race and seeing some of the city at the same time. A few of my friends were also travelling out to run, so it was a great opportunity for sightseeing and catching up. Registration for the marathon took place in the Berlin Tempelhof Airport, which is an incredible place. Tempelhof was one of Europe’s iconic pre-World War II airports and the main building was once among the top 20 largest buildings on earth. The airport featured very briefly in the classic movie Indiana Jones and the Last Crusade! The race itself runs in a single loop, starting and finishing in Tiergarten Park, the huge park in the centre of Berlin. As such, there is not too much time hanging around at the start of the race, and it’s very easy to travel there from most parts of the city. The route is incredibly flat and the roads are mostly wide, reducing the chance of being caught behind slower runners. There are also plenty of trees along the route, providing some shade if it’s a sunny day. The start of the race is beautiful as you run through the leafy avenues of the park. Beyond that, you are running through the streets of Berlin, and to be quite honest I found the majority of the route reasonably unmemorable, as there are few famous landmarks passed. Having said that, the last few miles of the race are particularly beautiful from an architectural perspective as you approach the area close to the Reichstag. The best thing about Berlin has to be the finishing straight, which takes you underneath the Brandenburg Gate, which was originally commissioned by King Frederick William II of Prussia as a sign of peace, and was completed in 1791. The finish is still another couple of hundred yards beyond the gate, but you really are uplifted after running beneath this famous landmark and there are roaring crowds lining the sides of the road beyond. To try and improve my running and to meet some fellow Londoners travelling out to the big races, I decided to join the Serpentine running club in 2010. It was through this club that I met a couple of other runners heading out to Chicago, which made the experience all the more pleasurable. I’d heard stories about Chicago before heading out. Previous marathons had either been incredibly cold or extremely hot. In fact, in 2007 the organisers cancelled the race after three and a half hours due to the heat (31 degrees Celsius) and a water shortage, which left one runner dead and over 30 hospitalised. My visit to Chicago turned out to be one of the hotter years. After getting overly excited with sightseeing the day before the race, I headed to bed with blisters on my feet. The Chicago marathon starts at 7am in the morning, which is much earlier than most other races. Fortunately it starts in the middle of the City and it’s very easy to get to the starting location. This is probably just as well, given that Chicago is probably the largest of the World Majors by way of runner numbers. You will be lining up alongside over 45,000 other runners from all over the world, which is truly epic! The route itself is interesting as you take in various parts of the City and run past the Willis Tower (formerly Sears Tower). The crowds can be a little patchy in places, but overall it’s incredibly well supported, with over a million spectators lining the streets. However, if it’s a hot and sunny year, don’t expect much relief from the rays amongst those towering buildings! 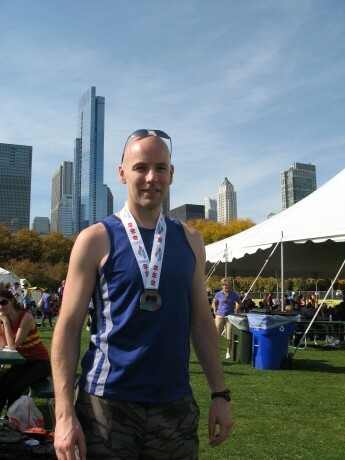 The best thing about the Chicago marathon was finishing in Grant Park. There is a huge party going on and you are surrounded by amazing architecture and sculptures. Quite simply a beautiful city to run around and a very memorable skyline to take in along the route. As mentioned earlier, the Tokyo marathon was only recently added to the list of Marathon Majors. It makes sense though, as the Japanese are fanatical about their long distance running and produce some world class athletes. Fortunately my brother also lives in Tokyo, so I had a great opportunity to visit the family and see my new nephew whilst running this race. Tokyo can be a little intimidating at first given the language barrier and seemingly complex transport system. However the Japanese are incredibly patient and helpful, so all you need to do is be polite and ask for some guidance, as people are only too willing to try and help. This marathon takes place in February so it can be rather cold, particularly given that Tokyo had received heavy snowfall the week before the race. You have a couple of hours of hanging around for the start of the race, so make sure you have some old clothes to ditch, or a dustbin liner to keep you insulated. The start of the race was a little confusing, as it appeared that charity runners were set off ahead of the masses. As such, the first couple of miles were spent dodging and weaving through slower runners. Also, the toilets along the course were situated well back from the actual route. If you were caught short, you would have to run an extra 500m or so in order to relieve yourself. Perhaps this is for cultural reasons, but it’s a huge inconvenience when you already have to run 26.2 miles. My Garmin watch said that I’d run over 27 miles at the end of the race! The route itself is relatively interesting as you pass the Imperial Palace and a couple of other well known locations such as the Kumano Shrine and Asakusa. The course also loops back on itself a couple of times, so if you are fast, you will have the opportunity to see the elite runners at various stages of the race, which is an incredible sight to behold. Oddly enough the marathon terminates outside the city centre in an area called Ariake, on the edge of Tokyo Bay. Having said that, there are plenty of transport options taking you away from this area. I’d heard rumours that you are not allowed onto the public transport until you’ve had a shower, although my hotel was right next to the finish, so I can’t speak from experience. 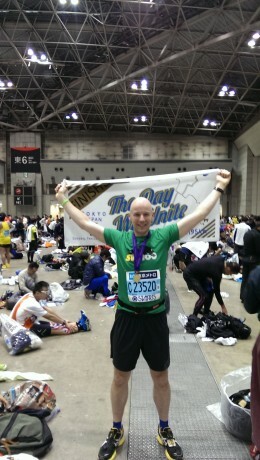 Hopefully the Japanese can overlook smelly runners on one day of the year! The best things about the Tokyo marathon have to be the lively support along the route and getting the opportunity to see the elite runners a couple of times during the race. The Japanese really love their marathons and crowds were lining most of the route. Last but not least is Boston. This is actually the oldest annual marathon in the world, having started in 1897. It’s also one of the toughest to get into, given that most of the runners have qualified by running a fast time. There are fewer charity spots and it can be expensive to buy yourself a place in this race. It took me over 10 years to eventually run a qualification time, so I was hugely excited to finally be a part of this race. I was particularly keen to participate following the unfortunate events in 2013. This actually seems to have unified runners and everyone else involved with the race, as everyone seems determined to show solidarity against extremist activity. The race itself takes place on Patriots’ Day and starts 26.2 miles outside of Boston in a town called Hopkinton. The organisers ship you out there on school buses, which is quite fun. However, on arriving at the start location, you then have approximately three hours to hang around before the race. In nice weather conditions this would be rather pleasant, but it was cold and rainy in 2015 which made the wait very unpleasant. Fortunately there were large tents to provide shelter, but it was still quite hard to stay warm. The course itself is rather undulating, particularly from mile 16 onward. 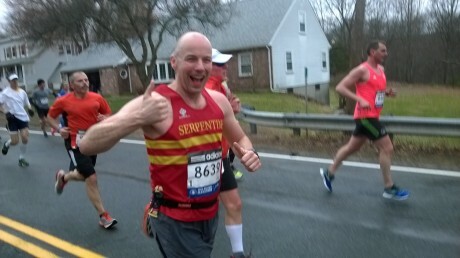 It is renowned for being one of the more difficult marathon courses because of the Newton hills, which includes the infamous Heartbreak Hill near Boston College. It’s also probably the greenest of the Majors, given that you start well outside the city and run along roads that pass through wooded areas and past lakes. The best thing about the marathon has to be the Wellesley college scream tunnel close to the half way point, where all the students come out and provide some very vocal support which can be heard from a long way off. This definitely seems to be a favourite section for the male (and some of the female) runners given that the aforementioned college is women only and kisses are offered. More can be read about the World Marathon Majors, also known as the Big Six, here. To date, apparently only 210 people have completed the Big Six so far. I thought that I was one, but I ran New York before it became a World Marathon Major, so I guess I’ll need to head back over there at some point!